Sometimes very very simple tips can save a lot of money and time for you as an online business owner. And this single tip alone can save you several thousand dollars over time. Its related to Thrive themes update and how you should do it. I speak this from my experience and my clients, who run successful businesses on WordPress and Thrive themes plugins. I speak this, also from the recent experiences on a facebook group for Thrive themes users who shared their woes. Update: Oct 19, 2018. It happened again with their latest 2.1.0 update where they made “just user interface” changes. 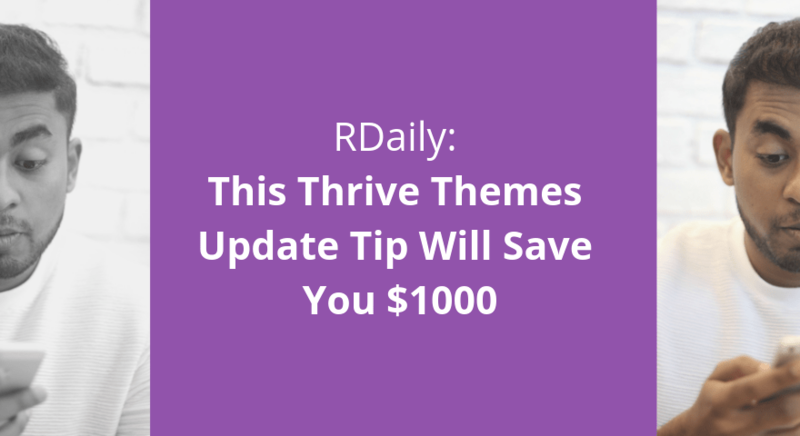 Here is the tip – Stop updating your Thrive Themes (and WordPress) plugins mindlessly. I know it is advised that plugin updates are “always good”, they have bug fixes and security updates, new features etc. All of that is true, except with Thrive Themes (and WordPress in general), it is a bit different. So, what has been happening in the past with Thrive themes updates? For the last 2-3 years, every time Thrive themes releases a major update, things definitely break and all hell breaks loose. Their forums (now non-existent) get hundreds of bug reports and angry customers. I have seen this regularly with my customers too and personal experience. Their minor and patch updates are often okay. But still not reliable and can ruin an entire weekend for you because you were trying to fix everything it broke. Wait, what are Major, Minor and Patch Updates? Every plugin or theme in WordPress (and software in general) has a version number. It kinda looks like this – version 8.4.2. The first number is 8 – that is the major version. Second and third numbers are minor and patch versions. By definition, major versions can break the internal wirings between your software. But with Thrive themes they even break their own software often. Major versions are the riskiest. Minor versions by definition, are in-between, sometimes have new features (but cannot break any functionality on your site). If your last version is 5.4.1 and you see there is an update for 5.4.2 or 5.4.3, its most likely to be the safest and things can’t break. Again this is only by definition and not guaranteed. Historically Thrive themes have broken things even in patch versions. If you see an update from 5.4.1 to 6.0.0 or more, don’t update immediately. Read their release notes. If that is too hard to understand, do what I explain below and then update. If you see an update from 5.4.1 to 5.5.0, then I usually update it (except for Thrive themes). My recommendation is you do the same. So How When Do I Update Thrive Themes Plugins Then? The solution is super simple. Just delay updating your plugins. When a major version is released, wait for 4-8 weeks. By that time, a lot of minor and patch version would be added as bug fixes and the release gets stable. Lot of early-adopter users are happy to test and help fix buggy software. You can focus on your important business tasks – making content, researching, delivering instead of dealing with broken websites. When a minor version is released wait for 2 weeks. For patch versions, you can update immediately in most cases. But follow the recommendation below. Does your hosting offer daily backups? If yes, then you are safe in most cases unless you did a lot of work just before you update the plugins. So perhaps update first thing in the morning. Then, if you see things broke, you can immediately restore the previous night’s backup. If not you can setup Updraft Plus. Foolproof free backup plan: Install UpdraftPlus – its free and uploads all your backups to Dropbox. Before you update anything, create a backup. The first time setup takes a few minutes. But after that, it takes just 1-click every time to back up your entire site. Also you can schedule it to run automatically regularly. Test the updates on Staging site: Not everyone can do this, but web hosts like Siteground (affiliate link), WPEngine, FlyWheel etc. offer 1-click staging sites. You can clone your entire site to a staging site. Then update/test your pages and flows. If everything works fine, then copy the staging back to the live server. This website has been running on Siteground for almost 2 years now. If you are hosting on cheap host like Hostgator, Godaddy, Bluehost, Dreamhost etc, its more likely that its already costing you in speed and reliability. Switch to a better host asap and feel a massive difference in how you operate. Have a checklist of pages and important flows to check: After every update, please check your important pages on desktop and mobile. Then check your important lead magnets, sales pages etc. I understand this might seem a bit too much over the top, but it is important to have this regular maintenance routine of checking and testing. Think of it like servicing your car before it stops working. We do this so that it doesn’t break in the middle of your way to the office or a long road trip. And bigger your business is, more the need for this activity. Maybe I’m Complaining and Being Too Hard on Thrive Themes. I will still continue to use Thrive themes. So will my clients. They have been getting better and releasing new features constantly. I understand the challenges of a growing company and we all love Shane and his team, don’t we? 🙂 They give us great content and help us with our businesses. Their products are the cheapest and helped thousands of us to step into online business world. So I am just sharing my strategy to err… survive their updates, so that all of you need not waste your time. Above points are valid for many other plugins too, esp. in the past I’ve seen WooCommerce updates break sites and few other plugins the same. So bottom line – please update your thrive themes plugins and WordPress plugins wisely.